My friend Kim lives in Perth and I have been very fortunate to have been able to visit her to see where she lives. The first time I was there she drank lemon, lime and bitters, which I had never heard of before. I love the name of the drink but not having ever tasted it as it has sucrose, I had to use my imagination to create something at home. Traditionally this is a drink made with lemonade, lime cordial and Angostura bitters. 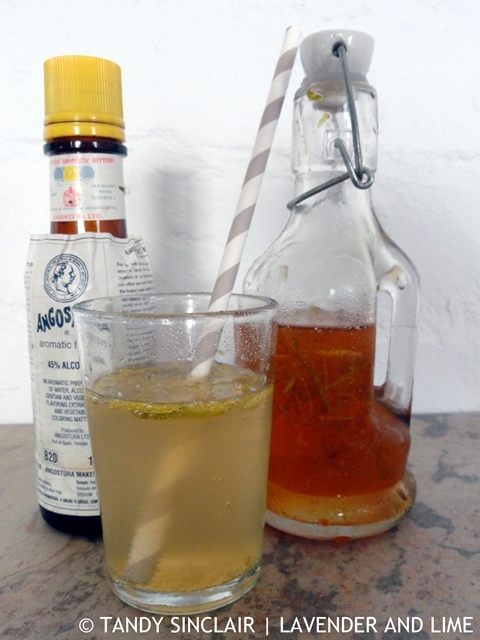 I love bitters in my gin and tonics, and even just in plain soda water as a refreshing change to what I drink. Being on a cordial kick at present I decided to make a cordial using the ingredients as suggested by the name lemon, lime and bitters, rather than what the drink should be made of. The result was the most addictive cordial I have ever tasted. I mixed it into my water bottle at a ratio far higher than what I normally would do, and I could not get enough! It is sweet and tangy and very syrupy. I am looking forward to summer weather, and using this to flavour an ice cold G&T. This cordial mix is so amazing, you will find any excuse to have a drink to use it. Reduce the sugar by 10% if you don't want it sweet. This makes a very syrupy cordial. This drink sounds ideal to drink in warm hot weather! I totes thought LLB was a everywhere drink. I love lemon, lime and bitters too! Such a refreshing bevie. Just went to the bar and ordered me one. Oh, I love your take on this Aussie/Kiwi favourite – Tandy. A great use for bitters – I have a bottle lurking that I have only used a few splashes of! I’ve never thought of enjoying bitters without alcohol, but this sounds so tasty! Hi Tandy, this drink sounds refreshing, perfect for anytime of the year. Anything with lemon or lime in it wins over my heart! Just love those flavors. Can only imagine this drink is amazing for that reason. Have a lovely week! Sounds like a fabulous cordial Tandy. I love lemon, lime and bitters too! I thought it was a universal thing but clearly not 🙂 Clever idea making your own Tandy!